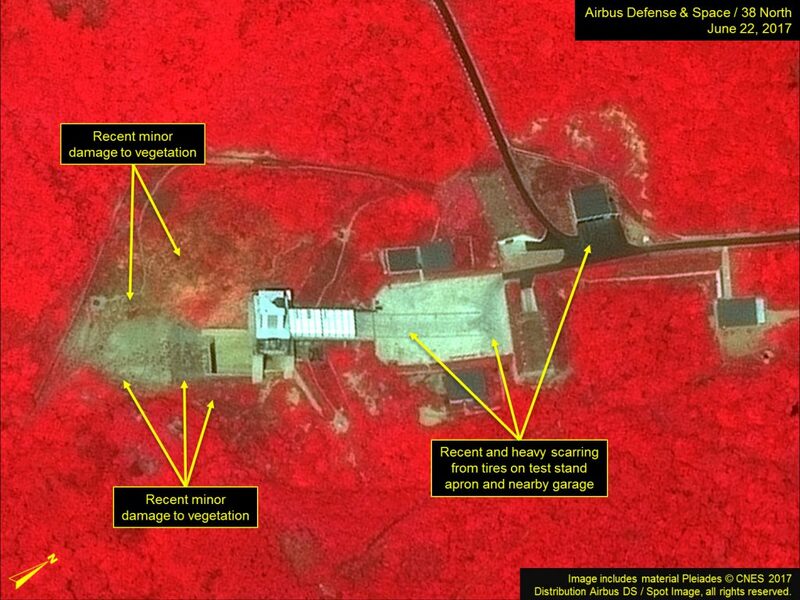 Recent commercial satellite imagery confirms media reports that North Korea conducted a rocket engine test at the Sohae Satellite Launching Station on, or about, June 22. While it was reported that this test “could be for the smallest stage of an ICBM rocket engine,” and the June 22 imagery shows evidence of a recent small rocket engine test, it is not possible to confirm whether this test was for an ICBM engine using imagery alone. Both natural-color and color-infrared imagery of the vertical engine test stand from June 22 show numerous tire tracks on the test stand’s apron and at the nearby garage that were not previously present in a June 10 image, indicating recent heavy vehicular traffic. Such traffic is similar to that seen for previous engine tests. More significantly, the image shows widespread, but minor, damage to vegetation surrounding the base of the test stand where rocket engine exhaust is directed during tests. The minor damage suggests that the recently conducted test was of a relatively small engine. Whether the engine test was “for the smallest stage of an ICBM rocket engine” or some other system cannot be determined from the imagery alone. No vehicles or personnel are observed in or around the test stand. 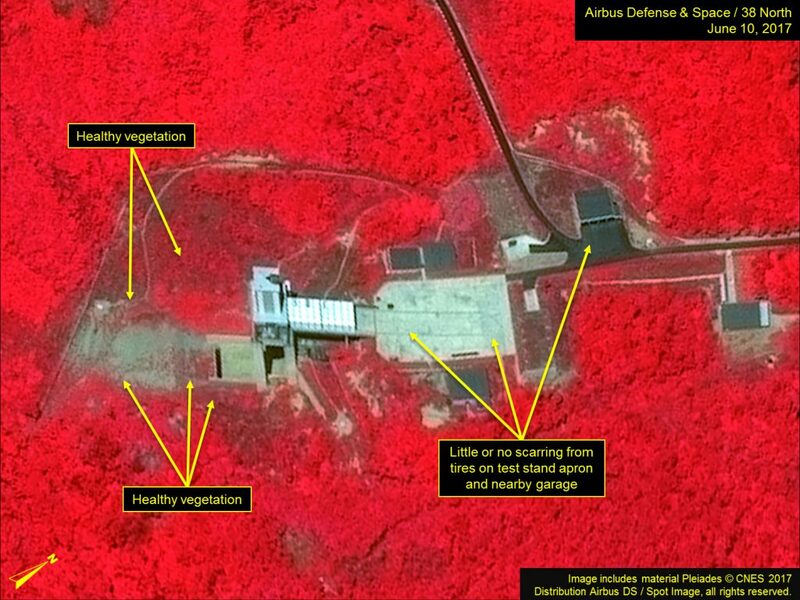 The fact that this test was conducted only twelve days after the June 10 image showed no evidence of test preparations reinforces that North Korea possesses the technical and logistical capabilities to conduct such tests with little or no advance warning. Figure 1. Recent damage to vegetation and scarring from vehicular traffic observed. Figure 2. Color-infrared images from June 10 compared to June 22 show minor damage to vegetation occurred recently. 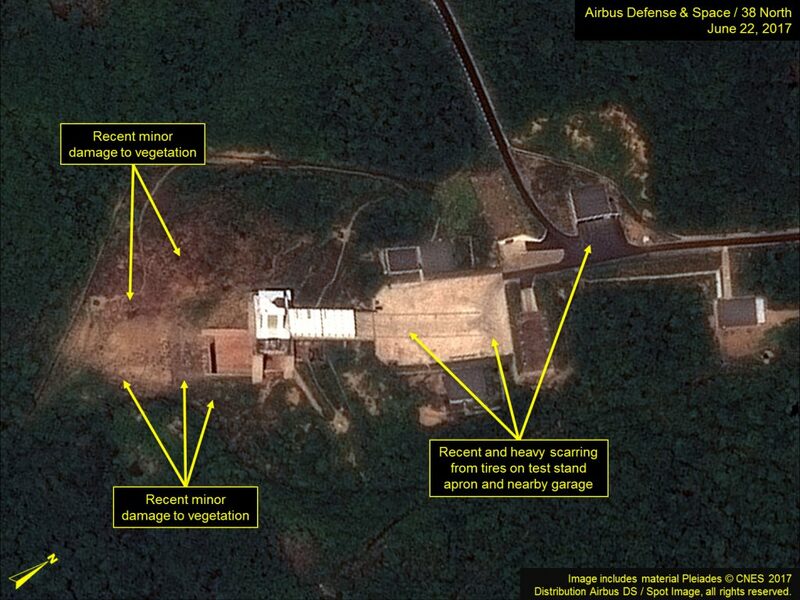 As noted previously, since March 2017, the North Koreans have undertaken a construction project located approximately 50 meters southeast of the launch pad. The June 22 image shows that this construction continues slowly, as what appears to be building footings and the beginnings of walls are evident. 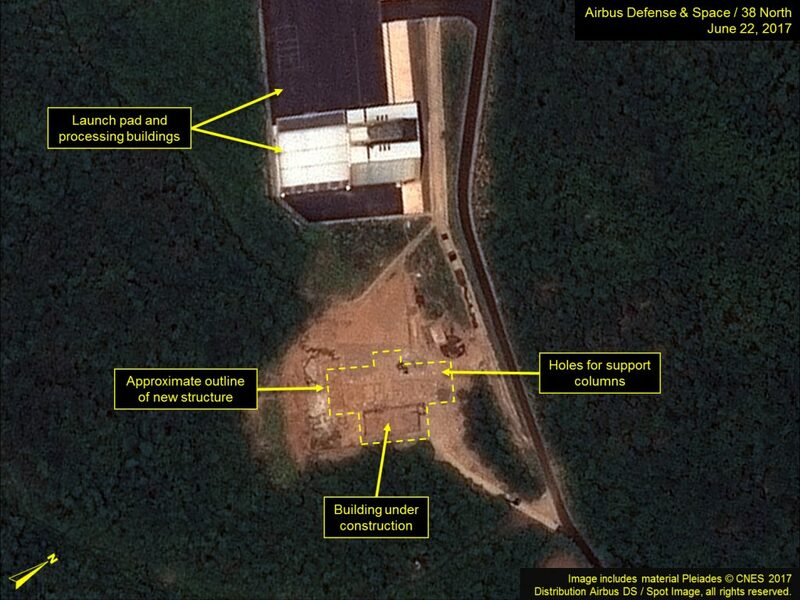 The planned purpose of the new structure is unknown, however, its proximity to the launch pad suggests it will likely be used to support launch operations. Figure 3. Construction continues near the Launch Pad. With the exception of what appear several small vehicles, no activity of significance is observed elsewhere in the facility in the June 22 image.